34 pounds. That’s all that separates Jamie Staples and his younger brother Matthew Staples from winning $150,000 of that sweet, sweet Bill Perkins money. As a reminder, the brothers were offered 50-1 odds by Perkins that the brothers couldn’t weigh within one pound of each other. Jamie weighed 305 at the time. Matthew was just 130 pounds. “I weighed in about six days ago and I was 212 pounds, and my brother was 178 (Monday) morning,” said the elder Staples. That means that by March 26 at 5 pm, the pair only have to work off 34 pounds. Originally, the brothers were trying to get to 180 pounds, but that’s no longer the plan. “I would say we’re (looking at) around 187 right now. It will depend on how the next two months go. I think 180 would be ideal, but it’s maybe a bit optimistic,” said Staples.. Dropping 93 pounds over 10 months has been a challenge for Jamie. The brothers have worked with trainer Mike Vacanti even while traveling around the world. Staples has taken his live stream set up to Montreal, Vienna, and Split (Croatia) and even as he moves from city to city, he’s managed to find ways to eat healthily and get in the necessary work. 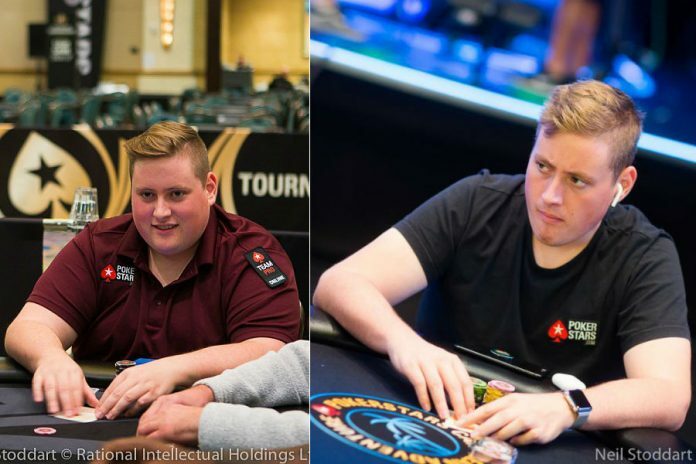 The Canadian Team PokerStars Online Pro admits that the hard work has been fun and it’s allowed him to discover ways he can live a healthy lifestyle while living life abroad or traveling from tournament to tournament. “We’re aiming for 1,300 calories a day, so every day you’re slowly starving yourself, and you feel the effects of that in terms of concentration and energy and mood and mindset, so it’s very draining, and I’m tired. I’m ready for it to be done,’ said Staples. If you read that and think that having any sort of issues with concentration, energy, mood, and mindset could have a negative impact on a poker player at a live tournament, you’re right. Jamie knows it too. Matthew, on the other hand, is literally and figuratively on the other end of that scale. The diet he’s on has him eating an average of 3,500 calories per day. It’s a lot of pasta, rice and potatoes, not to mention some other foods that will help him pack on some pounds. There are just 2.5 months left before the weigh in. They get one shot at hitting their number but have planned out that day already to make sure there’s no last-minute drama.